Nobody wants their computer to run slow, but in order to perform well you need to keep an eye on its functioning and should clean it regularly. The manual work is always a tedious task and consumes more time in doing so. 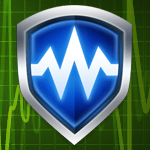 Wise Care 365 Free is a freeware tool that can maintain your PC frequently and removes all the unnecessary data on your PC without disturbing its performance and stability. Wise Care 365 Free is a complete tuneup utility with comprehensive features and a user-friendly interface. It contains important PC tuneup utilities like registry and disk cleaners which can detect more invalid registry items than the popular CCleaner. With just one click, your old PC will transform into a new and faster one. The scanning speeds as well are fast and effective compared to other optimization tools. Many experts consider Wise Care 365 Free is the best solution to improve your PC’s performance. The latest version Wise Care 365 2.73 has improved cleaning for Internet Explorer 10 and higher versions. It has fixed share links for Facebook and Twitter, updated translations, and improved GUI. The free version is available for download from its official website which has some locked features, whereas the PRO version unlocks them using a purchased license. PC checkup and one click solution which is able to find more hidden problems than other optimization tools. Wise Care 365 Free has five main elements included – PC Checkup, System Cleaner, System Tuneup, Privacy Protector, and Wise Utilities. 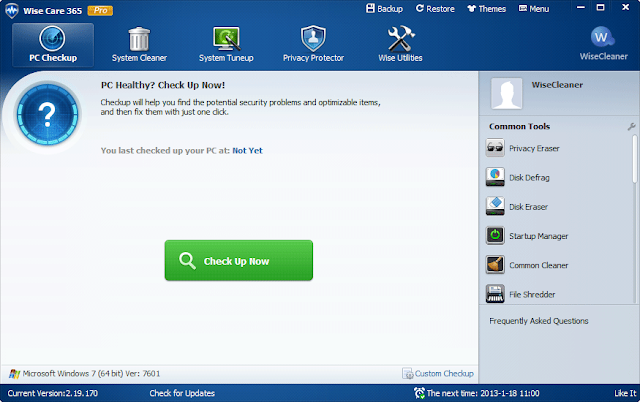 PC CHECKUP, checks for items which are to be optimized automatically and manually. The items include junk files, invalid shortcuts, thumbnail cache, memory dump files, error report files, downloaded files created by windows, system log files, etc. PC Checkup after checking shows the ‘PC Health Index’ ranging from 1.0-10.0 along with a health status icon. Click “Fix Now” to fix all the checked problems that are suggested. 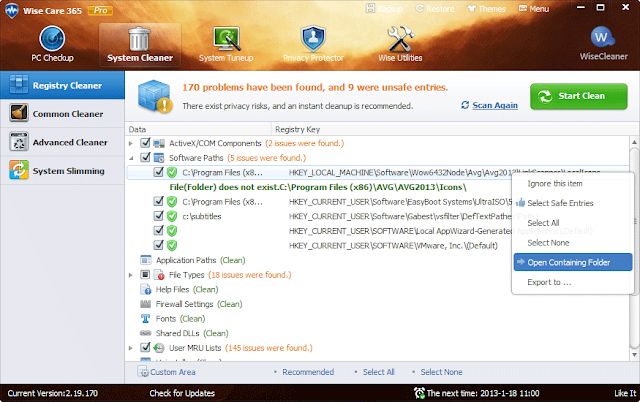 SYSTEM CLEANER has again four sub modules – Registry Cleaner, which fix the unsafe registry items; Common Cleaner, which removes useless files and traces and protects your privacy; Advanced Cleaner, which finds targeted areas of your PC such as files with certain extensions only; System Slimmer identifies things you can safely delete to regain more disk space, such as the sample multimedia files in Windows. For experts, the program allows you to choose the type of registry entries that should be removed such as invalid ActiveX or COM components, outdated startup items, missing DLLs, unnecessary files left behind after uninstallation. SYSTEM CLEANUP also includes four sub categories – System Optimizer for speeding up your system and network; Disk Defrag for defragmenting local disks; Registry Defrag for defragmenting your registry; Startup Manager for administering startup items and services in detail. The fourth module of Wise Care 365 Free is PRIVACY PROTECTOR which erases privacy risks like browsing history, shreds files that can’t be restored, and generates extremely strong passwords via Password Generator. The last module, WISE UTILITIES displays all Wise products to you for easy lookup and download. Finally, Wise Care 365 Free offers a great deal of improving your PC’s performance by removing items that slow your PC. The users are allowed to create a restore point or a full registry backup, in case of computer crashes. You can download Wise Care 365 Free or purchase PRO version from below link. The PRO version has a variety of custom skins and avatars, free 24x7 technical support and it auto updates in background as well.